Danetti the contemporary furniture company chose Forays Homes to show off their latest products. Danetti prides itself on designing beautiful furniture that enhances the spaces you interact with daily, combining functionality, form and style. They first teamed up with Forays to use our Highfield, Long Sutton development to showcase some of their key pieces of furniture and create a series of photographs to use in their marketing. You can see some of the images as well as the details of our Highfield development here. The Highfield development is situated in the heart of the village of Long Sutton in Hampshire and consists of two luxury four-bedroom detached family homes overlooking pastureland and the village pond; the location is stunningly beautiful. If you would like to get the Highfield look check out the selection of furniture Danetti used on their website. 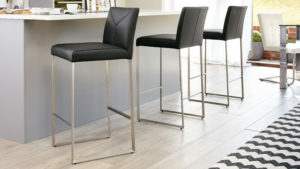 Their selection of bar stools and dining chairs complement the clean finish of the kitchen perfectly. 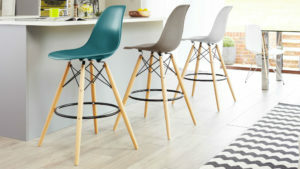 The classic design of the Eames Style Bar Stool £89.00 is featured in a modern inspired palette of colours. These would bring a great splash of colour to your home. If leather is more your taste, then their Monti Real Leather Bar Stool £169.00 is designed with comfort in mind and could be perfect for your home. 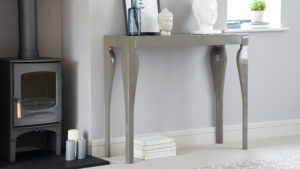 Danetti also featured their Sanza Oak Extending Dining Tables £599.00 and Eva Gloss Console Table £219.00. We think their furniture and our luxury homes work incredibly well together. To see the full range of products featured visit Danetti’s website and have a look around.